Alice Garvey in Editor's Picks Environment on 14 December, 2016. Although they have come to be associated with Christmas (at least within UK culture) reindeer are facing new challenges throughout the year. Although more consistently associated with festive jumpers at this time of year, such species as reindeer and polar bears are subject to real and intense environmental pressures – now and to come. Living at some of the most extreme reaches of the world, the wildlife of the polar regions is highly adapted to the hardships of climate. But this very adaptation and hardiness is under threat from environmental change originating in human action. Changes to sea ice and global temperature imperil the populations of these species and pressurise the struggle to survive in these habitats. Also known as caribou, the circumpolar distribution of this species means it is found across North America, Northern Europe, Asia, and Russia. Reindeer are singular as a deer species for both sexes have antlers. They are known to engage in migrations of over 3,000km per year to find food and different climates. They are particularly adapted to their climate with dense coats that insulate against the cold, and large hooves that aid them in snowdrifts and for digging and swimming. Although reindeer are currently of ‘Least Concern’ according to the IUCN (International Union for the Conservation of Nature) with regards to their conservation status, anticipated factors such as climate change look to impact them disproportionately for their situation in a fragile habitat and at the locus of several changing economies. The WWF lists several threats to reindeer populations, most resulting from climate change and its impacts upon temperatures and consequently vegetation. There are also some more direct human impacts such as the exploration for oil and forestry practices. Vegetation patterns are predicted to change as climate alters, the movement of ‘industrial development’ ever further north threatens some herds, and changes to migration patterns are expected as the vegetation changes. However, these changes are not all prospective – the repercussions of climate change are already being felt. 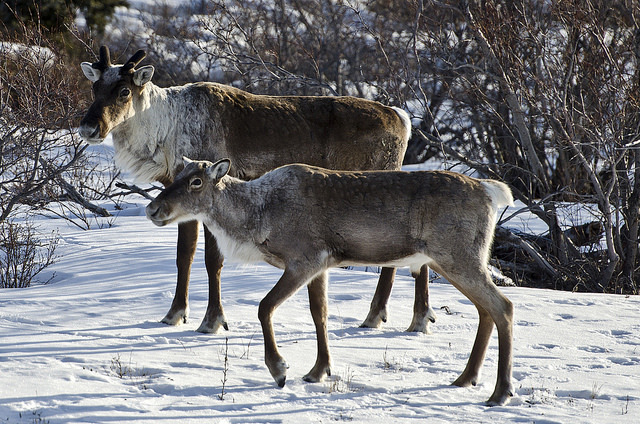 Rebecca Morelle reports that drops of 40% have been recorded in the world’s largest reindeer herd (BBC News). ‘Rising temperatures and human activity’ are cited as the source of the decline in the herd from northern Russia. These factors essentially alter the migration patterns of the deer, and this has attendant complications; rivers are bigger and have to be swum across; warmer temperatures encourage the proliferation of mosquitoes that force the deer to escape to cooler climates; the deer are forced to move to higher ground further north creating problems with summer food supply (BBC News). Morelle quotes Professor Andrey Petrov of the Arctic Centre at the University of Northern Iowa, America. Petrov comments ‘Reindeer are tremendously important for biodiversity – they are part of the Arctic food chain and without them other species would be in trouble.’ In this way, a species that has hitherto been thought of as stable and ‘common’ can be shown to be equally, if not more, vulnerable as most of the world’s species by virtue of its precarious habitat. Moreover, the vital interdependence between species means that every species is valuable in a context of global change. Reindeer live in extreme environments and so can be seen as subject to the most extreme effects of change. But there are plans in place to safeguard this species in a changing world, with reindeer under regulation in the several countries where they are found. The WWF is ‘developing an Arctic-wide conservation plan’ for the species, and in Canada the wildlife organisation is more specifically protecting ‘calving-areas’, implementing land use plans and managing development within the ranges of the caribou. Through the regulatory measures and sustainable conservation plans of NGOs and intergovernmental bodies, such as the IUCN, the impacts of climate look to be mitigated in order to protect this incredible species into the future.